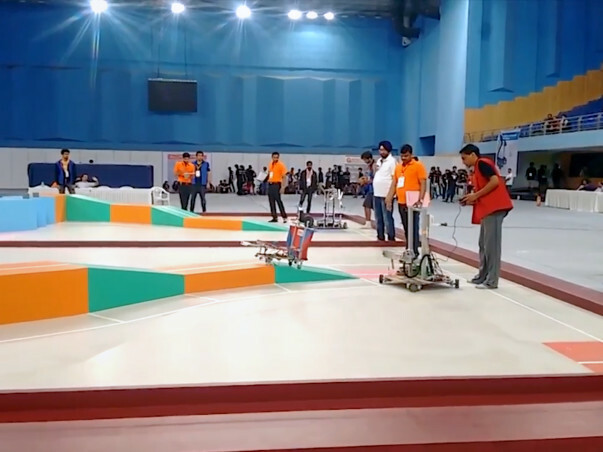 HELP US WIN ROBOCON INDIA 2018! Agnel Robocon Team is a part of the Agnel Robotics Club (ARC) which is the robotics club of F.C.R.I.T. Vashi. The team comprises of 25 Ingenious Engineers from different departments and batches brimming with technical knowledge, practical approach and management skills. The team's first appearance in ABU-ROBOCON was in the year 2013. Although this was our first step, the team's design and approach were highly appreciated. These ranks were bagged in a competition with teams from throughout the country. ROBOCON is organised by the Asia-Pacific Broadcasting Unit (ABU). It was started in 2002 and is presently the largest robotics competition in the world. It has gained the status of biggest robotics competition with 1500+ teams participating worldwide. Every year the organisation comes up with a new problem statement. The variation and the standard of problem statement gives ample opportunity to learn and implement various technical skills and also brushes up the managerial capabilities. The team winning the national leg of the competition represents the country in the international stage. For 2018, the international level of the competition will take place in NINH BINH, VIETNAM. Every year, the national leg of the competition takes place at MIT, Pune in the first week of March. Every year the host country (Vietnam for 2018) puts forward a theme which consists of challenging tasks to be performed by the participating robots. The theme revolves around the concept of 'play' which is the basic philosophy behind Robocon. The theme for 2018 is "Shuttlecock throwing" where two teams compete with each other to score points by throwing shuttlecocks through rings on poles on various heights and from different distances. The scoring is done on various parameters specified in the rule book. A match will be contested between two teams, Red and Blue, lasting for 3 minutes. The score at the end of 3 minutes will be compared and the winner will be declared. As per the budget, the financial requirement of the team is much more than what it can fetch by mere help from the institution & personal contributions. It therefore becomes an urge for the team to seek corporate sponsorship to let the wings of our passion spread wide & fly high. Your help will not only provide us with funds but also create a healthy symbiosis between your company & our team. An association with our team would surely guarantee a promising and effective human resource for the near future. TILL NOW WE HAVE BUILD MANUAL BOT, AUTOMATIC BOT IS IN PROGRESS WE ARE NOW ABLE TO MOVE MANUAL BOT THE PICK AND PLACE PART OF THEME IS ACHIEVED. WE HAVE TO BUY MOTORS FOR AUTOMATIC AND MANUAL BOT FOR BACKUP AND OF NOW WE DON'T HAVE BACKUP.PCBs FOR THE BOTS ARE TO BE MADE FOR WHICH WE HAVE TO BUY EPOXY. All the best to the team Regards, Tarun sarkar.